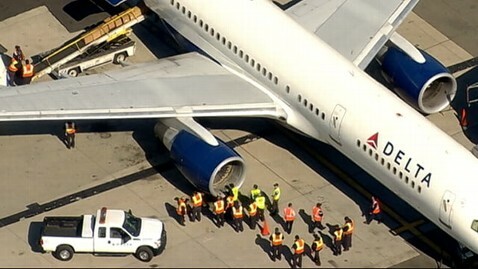 Delta Flight 1063 was forced to make an emergency landing at New York's John F. Kennedy International Airport after its right engine experienced a bird strike shortly after takeoff this afternoon. "On takeoff, the airplane had a likely bird strike," said a Delta statement. "As a precaution, the captain elected to return to JFK. The flight landed without incident, and we're working on reaccomodating the passengers." CNN's Ali Velshi, who was on the flight, tweeted that following the bird strike the cabin filled with smoke. Velshi also commended the captain and crew for "a quick turnaround & landing." "That was the scarest thing I have ever done in my life," he said. "[The] plane shook, I thought we were coming down." While the strike may have frightened many of the passengers, the audio recording of the pilot's communication with air traffic controllers revealed he could not have been calmer. "All is well," the pilot told the controllers coordinating the landing and response. "They can take their time and everybody can be calm out there." The number of animal strikes reported annually has increased from 1,793 in 1990 to 9,622 in 2010, with birds involved in 97.2 percent of strikes, according to the Federal Aviation Administration. Seventy percent of those strikes occurred when the aircraft was at less than 500 feet elevation, according to the United States Department of Agriculture. BirdStrike.org estimates that wildlife strikes cause more than $600 million in damage to U.S. civil and military aviation annually. According to the organization, more than 219 people have died worldwide as a result of wildlife strikes since 1988. Jet engines are tested to ensure they can take a hit from birds, but sometimes, as in the case of the Miracle on the Hudson flight in New York, a flock of large birds are too much for engines to handle. Currently, the largest bird an engine has to be designed and demonstrated to ingest is a four-pound bird, according to Paul Eschenfelder, a wildlife specialist at the Air Line Pilots Association. Eschenfelder says that none of the engines flying are designed or built to survive an ingestion of an eight to 15 pound bird or 25 pound swan. There have been 2,586 bird strikes at JFK Airport since Jan. 1, 1990, according to FAA data, though all were not necessarily dangerous or during flight. ABC News' Lisa Stark and Matt Hosford contributed to this report.